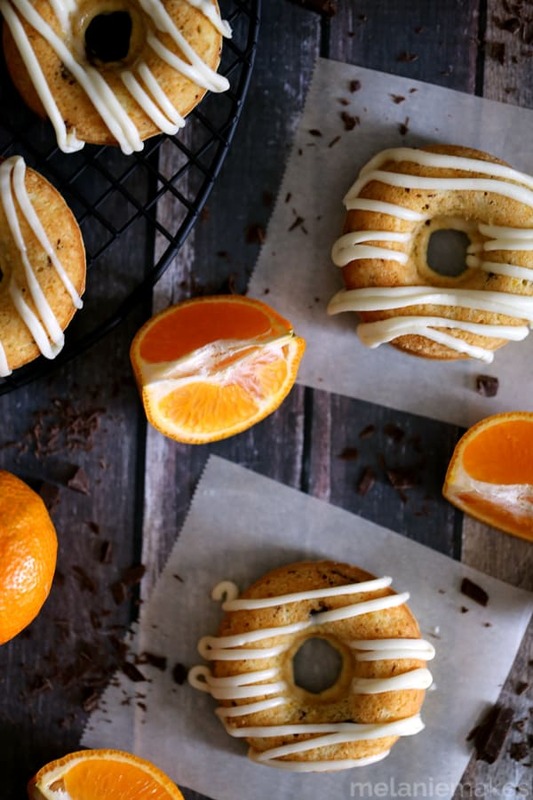 The classic flavor combination of orange and chocolate gets an upgrade with these Tangerine Dark Chocolate Chunk Donuts. 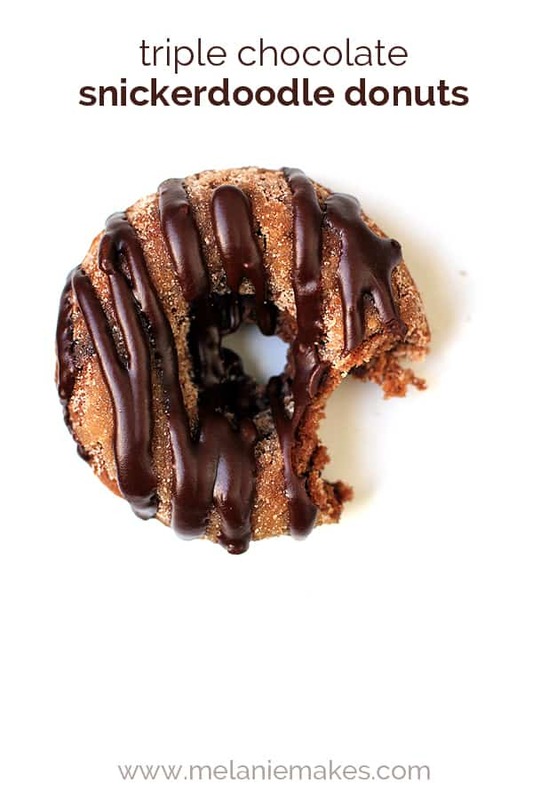 Tangerine juice and zest flavor this light and fluffy baked donut that’s studded with dark chocolate chunks. 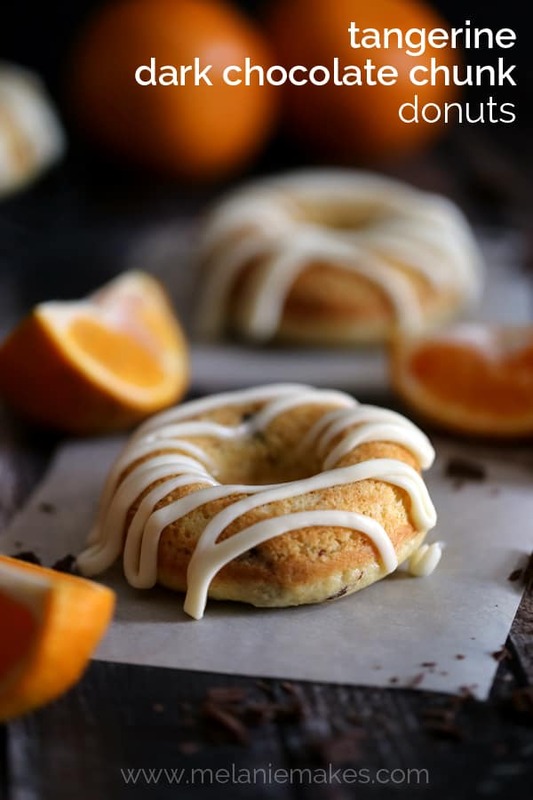 A tangerine spiked mascarpone cheese glaze is then drizzled over the top creating an irresistible morning treat. Most people have a preference of the type of baked goods they enjoy most, either fruit based or chocolate based. Although I tend to be in the chocolate camp 99% of the time, there’s something about fresh produce that makes me want to combine the two. That’s exactly what happened when a box of fresh Ojai Pixie tangerines landed on my doorstep, in a foot of snow. It was definitely time to bring the bright, sunny flavor of this amazing fruit to the forefront! Orange and chocolate are such a classic combination that I figured tangerine would pair just as well and was definitely pleased with the end result of my Tangerine Dark Chocolate Chunk Donuts. 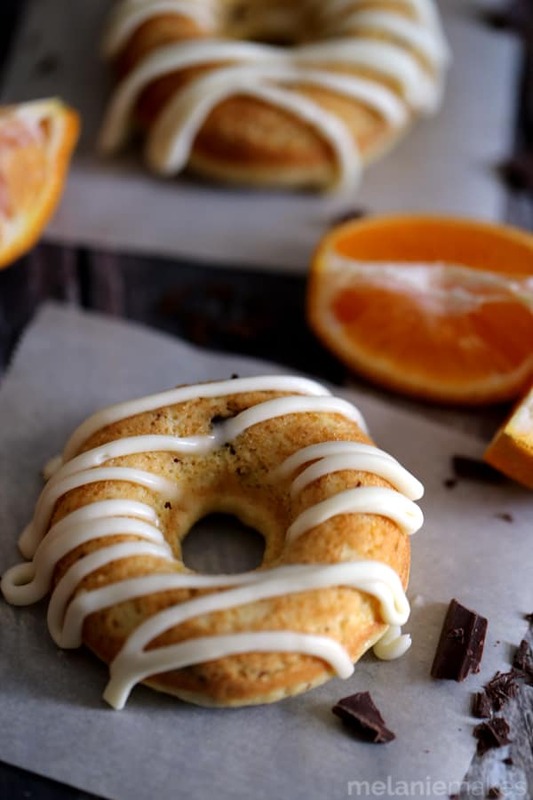 Tangerine juice and zest flavor this light and fluffy baked donut that’s studded with dark chocolate chunks. A tangerine spiked mascarpone cheese glaze is then drizzled over the top creating an irresistible morning treat. Spray donut pan with non-stick spray and set aside. In a medium bowl, whisk together flour, sugar, baking powder and salt until combined. Add tangerine juice, milk, eggs, vanilla and butter. Mix until just combined. Fold in tangerine zest and chocolate. Fill each well of the donut pan about 3/4 full and bake for 10-12 minutes or until donut begins to brown on the bottom. Allow to cool for 2 minutes in the pan before removing to a cooling rack. In a small bowl, whisk together mascarpone, powdered sugar and tangerine juice until combined and drizzling or piping consistency. A dozen of these donuts definitely didn’t last long on our breakfast table! Instead, our four year old was soon wheeling and dealing with her brother and sister to try to get one of their allotted donuts. What can I say, I don’t blame her! Paired with a glass of milk, these were the perfect start to our weekend. 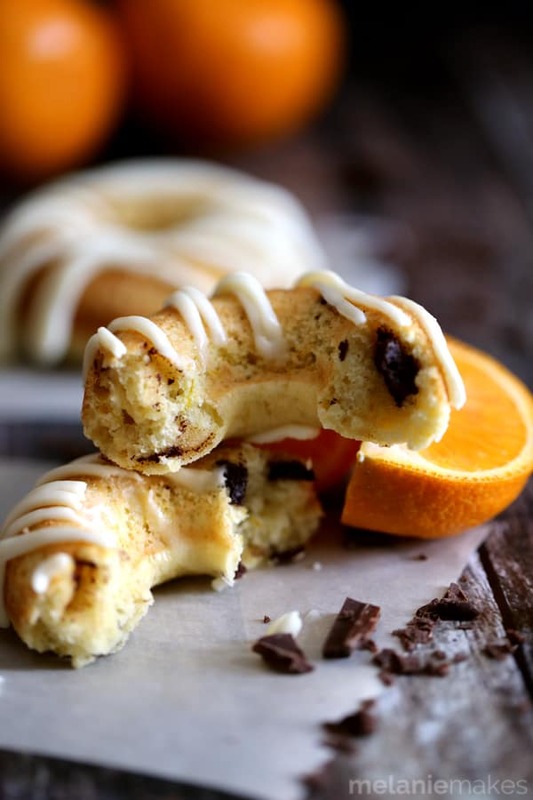 NOTE: Cleveland and Ohio readers, you can find the Pixie Tangerines that I used in this recipe at your local Heinen’s. Be sure to add them to your grocery list, they are a definite must have! The tangerines in this recipe were provided by Melissa’s Produce, no other compensation was received.. As always, all thoughts and opinions are my own. Thank you for supporting this sponsor that allows me the opportunity to create content, such as this, for Melanie Makes. LOL I'm actually searching online if they already have this menu of you. I want a quick food delivery for this! Adding this to my must try soon list for sure! YEP! I definitely need to visit your house! these look divine! Melanie I am obsessed with making donuts - I can't WAIT to try this recipe!! They look incredible. That glaze sounds amazing, and I love the fresh tangerine juice in the donut. Gorgeous photos too! You're so kind - thank you so much, Cate! I would say I am chocolate/peanut butter camp 99% of the time...yup making up my own camp! Ha. But I am totally loving these tangerine donuts with chocolate. Best of both worlds for sure! Oh yes, definitely a fan of the peanut butter and chocolate combo as well, Meg! I can easily eat a dozen of these! Love the chocolate and orange combination. This is a lot of yum! Chocolate and tangerine are such a winning combination. 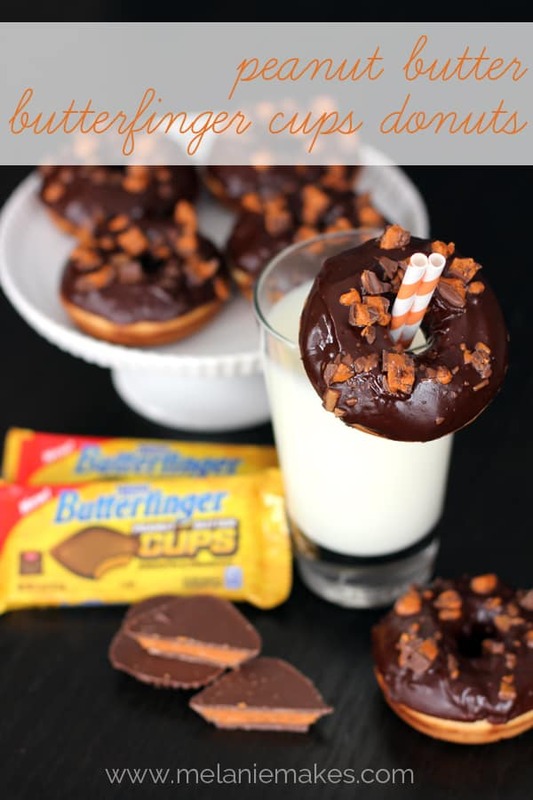 Plus, I am a sucker for all things donuts so these look so delicious! Tangerine and chocolate -- classic pairing! Of course you can, Ashley! Yes yes and YES! Such a great idea Melanie. 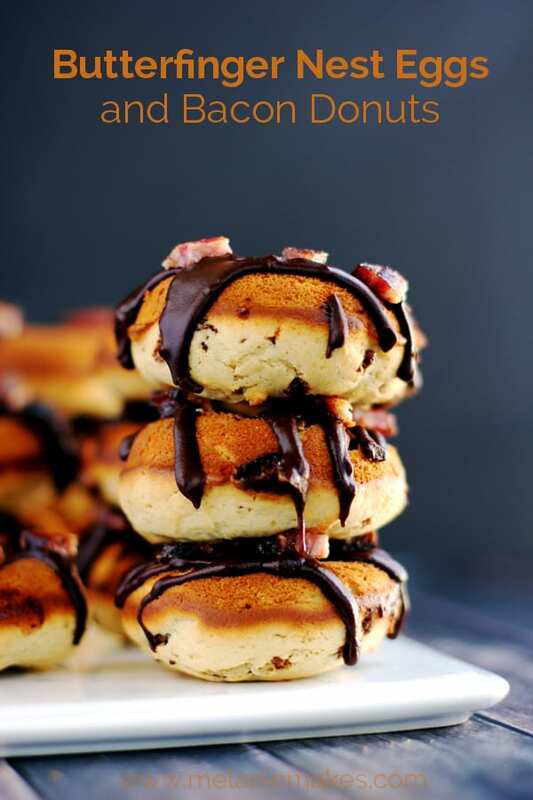 I have all those ingredients so this might be happening tomorrow morning! :) Woot woot! Hope you give it a try, Krista - let me know what you think! Love that you combined tangerine and dark chocolate! I would love starting my morning with a couple of these! They definitely make getting up a bit easier, Jessica! I tend to be in the fruit camp with my baked goods, but I do love dark chocolate! These donuts are the perfect combination to satisfy chocolate and fruit lovers! 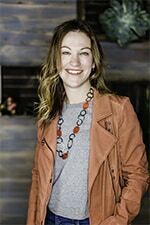 This is the perfect combination for you, Heather! YOU'RE*** Ohmygosh I can't even fathom how that happened. Cover your eyes! I really need to buy a doughnut pan!! Orange and chocolate are a classic pairing, so no going wrong here. Yes you do, Kacey - but make sure you buy two so you can make a full dozen at a time! Oh man do these look great! I love orange + chocolate. I would easily scarf down a dozen of these! Thanks, Liz - they definitely are addictive! I adore orange and chocolate together. These are the perfect donuts. I definitely need to get on the donut bandwagon!